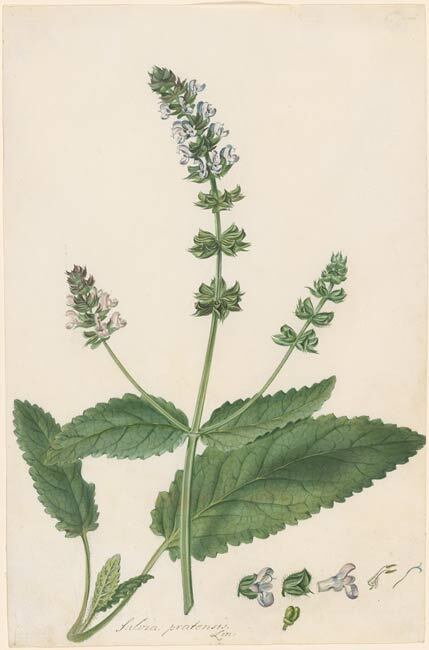 Inscribed in pen and ink near lower center: Salvia pratensis. / Lin. Margaret Cavendish Harley Bentinck, Duchess of Portland, Bulstrode, England; her sale, London, Portland Museum, Skinner, 24 April 1786 ff. (to Walker); Mrs. Elizabeth Walker; by descent to John Walker Ford; H. P. Kraus, New York. One of 73 drawings of ferns, flowers, and fungi by Ehret (1978.8:1-73).